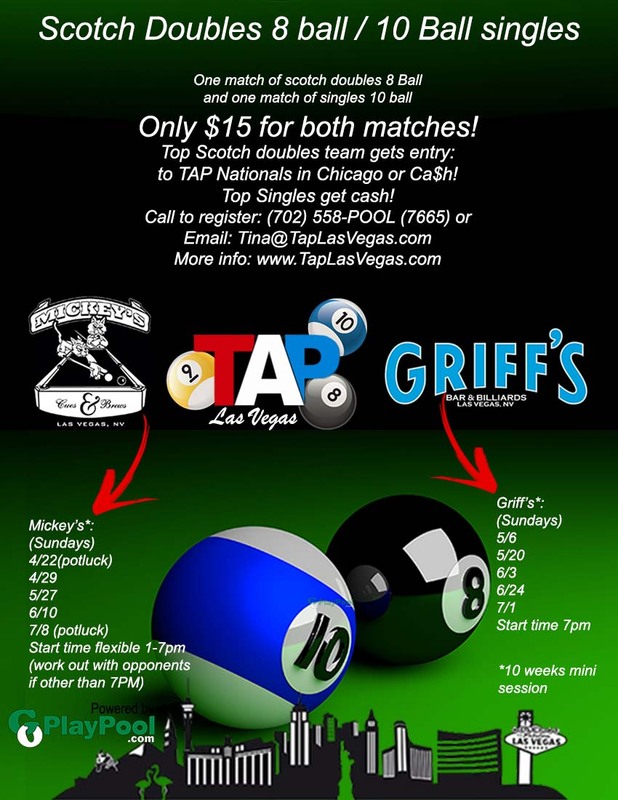 TAP Las Vegas offers a wide variety of standard weekly league opportunities! Join TAP today and have fun and compete in weekly league and the many special tournaments we have throughout the year! Call us at 702-558-7665, send us an email or click here to register today! Check out Places We Play! 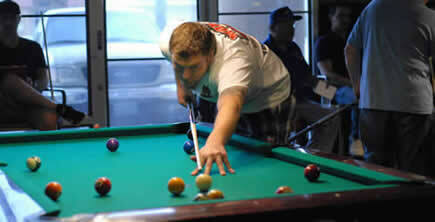 Mondays 8-Ball In-House at Mickey's Cues & Brews featuring Diamond tables. Mondays 8-Ball in the northwest. Play out of your favorite tavern or pool room. Tuesdays Grand Slam at Goodtimez Billiards, 8-Ball/9-Ball ACS Sanctioned, FREE pool till midnight (non-smoking playing on Diamond tables). Tuesdays 8-Ball/9-Ball in the south. Play out of your favorite tavern or pool room. 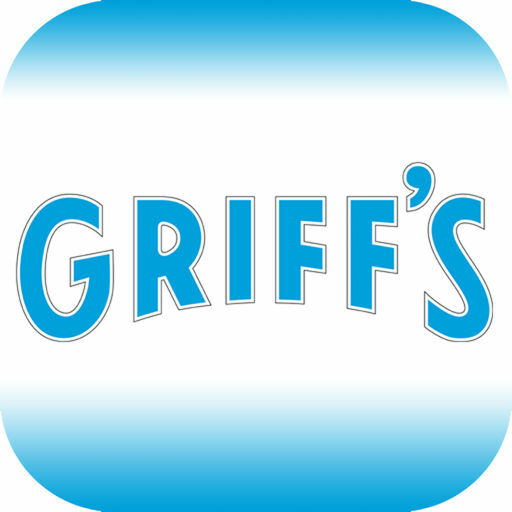 Wednesdays - 8-Ball/9-Ball in-house at Griff's Bar & Billiards, non-smoking pool room playing on Diamond tables. Wednesdays - 8-Ball/9-Ball in the south. Play out of your favorite tavern or pool room. Thursdays - 8-Ball in the south. Play out of your favorite tavern or pool room. Grand Slam Fridays in the south - 8-ball/9-ball in the south (ACS sanctioned, meaning players qualify for both TAP and ACS 8-ball and 9-ball). 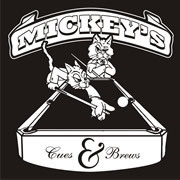 Sundays - 10-Ball Singles/8-Ball Scotch Doubles back to back in-house at Mickey's (must be competing in standard team divisions to be eligible) and Griff's. Combined h/c cannot exceed 11 to start. Teams playing 2 or more sessions will be eligible to compete in the Vegas Masters in the fall. ALL teams in every division WIN CASH! Easy scoring! We have an app for scoring, fully integrated with PoolNet, our on-line resource for stats and more! On-line stats, schedules and more! Computer generated handicaps based on overall play using 5 weighted categories from data obtained during league play. Vegas Masters State Championship Tournament Series where players can win trips to fantastic vacation spots. Two main National pool tournament events, along with other regional events. We even have a tournament in Niagara Falls! Charity tournaments - giving back to our community! 10 Years of history providing league play and awarding players for excellence! Well over $70K in 2016! Please be sure to take a look through the website and see the history documented right here for your viewing pleasure. If you would like an in-house at your favorite pub or pool hall, give us a call. We provide our services to bar owners at no charge! !